Atala - I had read the book of the same name by Yann Martell many years ago, and I remember enjoying the first half of the book, while feeling the second half lacked the same compelling narrative. Still, I remembered so little of the story that I felt that there was nothing to be lost by going again to see the movie. Perhaps Hollywood would work some magic to make the story more palatable. As it turned out, the film follows the novel quite closely. 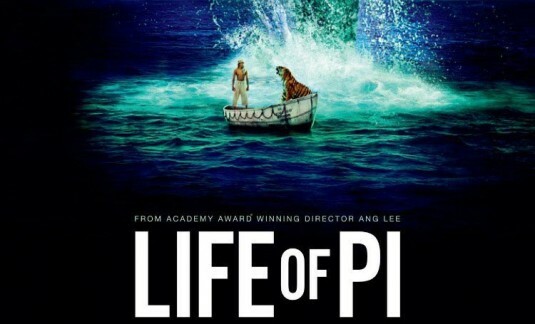 It's primarily about a Piscine "Pi" Patel, young man who is shipwrecked while he and his family are sailing from India to Canada with a collection of animals from the zoo that they owned in India, with the events narrated by Pi (now grown up) to a writer. It starts with a very tender and sometimes amusing description of his life in India, and goes on to describe how, when the ship is wrecked, he is the only human survivor, as every one else perishes in the sea. Well, yes - Pi is the only human survivor, but not the only survivor. Floating along with him in his lifeboat are a hyena, an orangutan - and arguably the deuteragonist of the story, a Bengal tiger with improbable name of Richard Parker.